The proposal in my living room was spur of the moment. Erik had actually thought about proposing in a couple of other locations, including the High Line Park in the Meatpacking District, which opened last summer (though finding a private place at the park would have been difficult, so I’m glad that didn’t work out!). The High Line was originally The High Line was originally constructed in the 1930s to lift dangerous freight trains off Manhattan’s streets. It was in active use until 1980, but then was abandoned and overgrown with shrubs and weeds. A redevelopment project went underway, and now the High Line is a beautiful park that runs from the Meatpacking District (the neighborhood just north of the West Village) through West Chelsea and into midtown, ending at 34th street. Erik had wanted to take me to the High Line park for weeks, but I insisted we wait until the weather was warmer. We were lucky that the day Erik proposed was sunny and hot, but not too humid. We took the subway down to the Meatpacking District to do a little exploring. The walkway of the High Line Park stretches almost one and a half miles along the Hudson River. From the High Line, you can see New Jersey (that’s Hoboken – where I lived last year – in the photo on the right) and even the Statue of Liberty is visible if you know where to look. 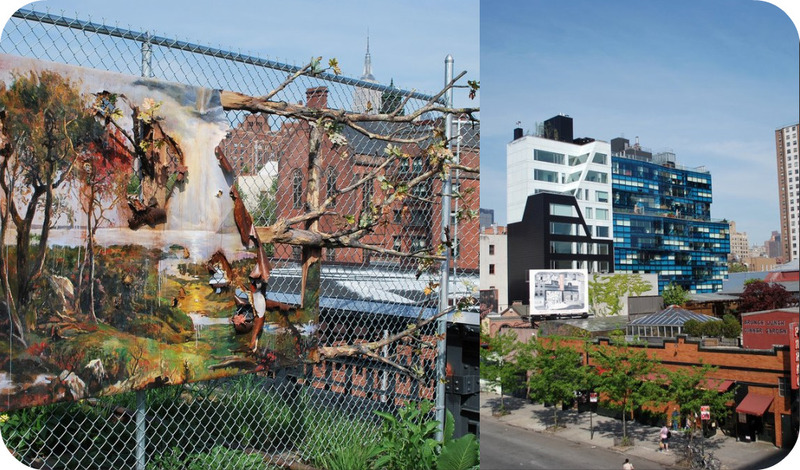 Towards the end of the High Line walkway that is currently developed, there is a great art installation. As a nature lover, I thought it was fantastic. You can see the Empire State Building peeking behind the the chain link fence. New York City is filled with contrasting architecture, and we loved the view of the simple brick restaurant in the front with the funky post-modern apartment building in the back. The High Line Park is suspended above the streets of Manhattan, so you can see the bustling activity from above. These cabs were photographed driving down the main drag of 14th street. 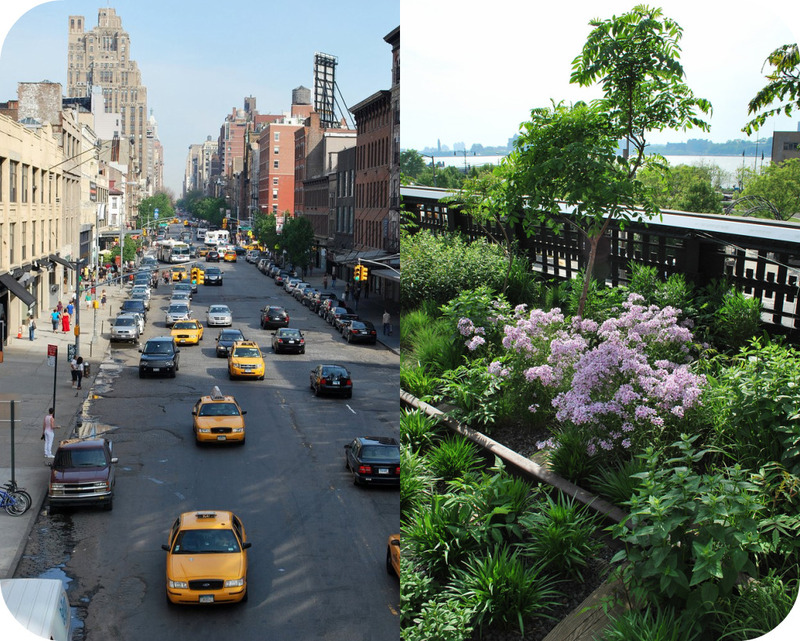 The High Line Park is more than just a simple walkway. It’s truly being developed into a suspended nature preserve. We saw lush greenery and beautiful blooming flowers along the walkway. We spoke to some volunteers with Friends of the High Line and apparently there is a section of trees that are in the works. Looking forward to see what that looks like!